A phone with a gorgeous display, the Motorola Droid is one of the best phones that I can recommend, having won the Editor’s Choice Award of 2009. 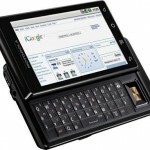 A slim handset with a sliding QWERTY keyboard, with a touch screen of 480×854 pixel, the Motorola Droid is the company’s maiden venture into the Android smart phone. With an alliance formed between Google, Motorola and Verizon, the company has at long last come up with the most exquisite and technologically advanced device, produced by it so far. The bounty of Google treasure is a part and parcel of the Motorola Droid, like, Gmail You Tube and Maps plus MS Exchange support and the accompanying amenities. Along with a GPS that is compatible with Google Maps, Bluetooth and WiFi, this smart phone can also boast of an A2DP stereo along with a 5 mega pixel camera.It has a standard 3.5mm headphone jack, interchangeable battery, micro SDHC support with a 16GB Card and runs the Android version 2.0., shortly to be upgraded to 2.1. In a few words we can say that the Motorola Droid is the most powerful and fastest Google Android phone ,that can easily rival the other touch screen phones in the market. .In fact it has a super call quality and lengthy talk time and a better speed than the previous Android devices in the market. However, the Droid’s music quality does not seem to up to the standard, it cannot support Bluetooth voice dialing and the keyboard is quite flat while the dial pad control is restricted to the home screen. Above all what we miss here is the lack of Dual mode functionality for world roaming. Physically the Droid is not one of the most attractive phones in the market. A combination of plastic and metal and is quite hefty, but solid. However soft touch materials and gold highlights give it a smart look. In comparison to the IPhone3GS, the body is narrower but it still has a larger high resolution screen and a physical keyboard. The Motorola Droid has an Arm Cortex A8 CPU , a 256 MB Ram. The CPU is in fact similar to the chip inside the IPhone3GS. 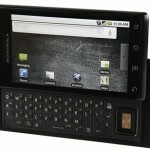 It was found that the Droid responded on par with other Android devices and there was no time lag in the responsiveness. The Droid is under upgradation as said earlier. This includes an Apps Gallery and Google Maps that will have personalized suggestions not available before, and starring synchronized with the desktop version of the maps. 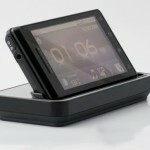 It is also said to include a pinch to zoom multi touch for the browser, as also some special weather and news widgets that only the Nexus One users currently enjoy. Besides this another interesting and exciting feature is the ‘voice to text’ entry ie users, upon tapping the microphone icon on the virtual keyboard, can speak into the phone when sending email. Also photos can be shared and viewed by taking images from the online picasa web albums. Finally Live Wallpaper though not an important feature but fun to use will now be available for the Motorola Droid’s homescreen in 2010. But whatever it is purchase of the Motorola Droid is an exciting proposition because this time Motorola has successfully manufactured a device that can easily be compared with the best efforts of Apple, HTC and Palm. How did you get hold of DROID? Review looks as if it is first hand. What’s the current Android version we would getting with the new Droid? And is the new Droid incredible and Droid 2 Global any better than this version of Droid? The speed comparison would not be great with the iPhone, as I won’t call the iPhone as the fastest phone around.